Master Estgar æt Hrofecaestre, known also as Angus Pembridge. Photo by Cateline la Broderesse. 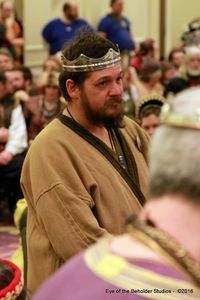 Master Estgar æt Hrofecaestre, known also as Angus Pembridge (formerly Kerr)was introduced to the SCA in the winter of 1993, yet did not make it to an event until Fall Crown Tournament in 1996. He has resided continually in the East Kingdom since then. He is the Fourth Baron of Concordia of the Snows, now ruling singly since Her Excellency Laurencia of Carlisle abdicated on 9/1/2007. On 5/23/09, at the War of Roses in Concordia, he was inducted into the Order of the Laurel for his mastery of medieval timberframing and wattle-and-daub construction. His expanded arts include woodworking, lampwork bead making, and historic cookery. He is a Companion of the Tygers Combattant, the Order of the Maunche, and the Order of the Silver Crescent. He also proudly holds membership in the King's Order of Excellence. He is a founder of an early historic camping household and was formerly the Head of Clan Kerr of the East and Head of Nafferton Manor, a household within the East Kingdom which attempts to recreate an English Household in 1380. He was a long-time Companion of the Company of Saint Michael, a 14th Century Tournament Company. Angus Pembridge (Kerr) was born west of Ferniehurst in Scotland in 1340. The third son of the Chieftain, he was destined to serve the Church, which he patently refused. In 1348 when the Great Mortality struck, he saw firsthand the capriciousness of fate. He refused the education offered, and at the age of thirteen left home to find what lay south of the Border. There he met and married an English woman, who would later succumb to the Mortality. It was during these years that he enlisted in the service of Edward III, and his son Edward of Woodstock, by way of an Irish knight. He first came to the attention of Edward of Woodstock at the Battle of Poitiers in 1356. Afterwards, he did many years good service in the retinue of Edward, eventually being made Baron and Lord of Nafferton, a small manor in Yorkshire. He currently is active in Gascony, having made a good living there, selling his sword to those who can pay in times of peace, and always serving his King in times of war. Angus spends his time studying the agricultural and construction techniques of the 14th Century. He has spent many years as a beekeeper. His main passion these days is timber framing. Angus spends most of his time these days as part of an Anglo-Saxon recreation society, where he is known as Estgar æt Hrofecaestre - the East-Spear. Angus Pembridge is sometimes known as The Medieval Woodwright . This page was last edited on 24 January 2018, at 14:46.